Summer is the favorite season of many people thanks to the beautiful weather and warm temperatures. As enjoyable as summer can be, however, it can also stir up some dangerous and potentially damaging weather conditions that can cause costly repairs and damage. Hail is a unique form of precipitation that might look innocent in size, but can actually create major damage to your roofing system. As durable as a roof may be, hail can be pretty destructive, causing minor shingle damage or worse, depending on the style and construction of your roof. Severe hailstorms occur all throughout the country, and if one passes over your home or business, there are a few things you might want to check once the skies clear to ensure your roof lasts for as long as it’s intended to. – These exposed components on your roof lack any protection, meaning that hail is striking directly, making them most vulnerable to hail damage. – If hail wears away or damages any sealant, this can allow water to begin wearing away the bond and seep into your home or business, leading to a leaky roof in the matter of a year or two or less. 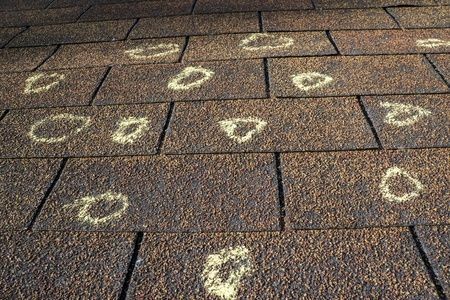 – Hail impacts can usually be identified on shingles by looking for small circular areas that are typically black in color and soft to the touch. These weak points can begin to degrade faster than other shingles, leading to a less effective roof. – Examine wooden shingles for any sections that show signs of damage with no visible pattern or that have splits in shingles that are brown-orange in color. These are generally signs of hail impact and, like asphalt shingles, can lead to a reduced longevity of these sections. Following a hail storm, it’s best to inspect your roof for any signs of damage, big or small. Whether you inspect your roof yourself or you call on a professional to do the job for you, it’s a smart choice that can save you money down the road if something is actually broken. Identifying any damages early on and making necessary repairs or improvements can help prolong the longevity of your roof, keeping you and your home or business dry and secure. Keep in mind, the age and condition of your roof, as well as the size of hailstones and intensity of the storm can greatly affect the extent of damage your roof suffers from. If your roof gets pummeled by large hailstones that severely damages its surface, contact Roofing by Bruce for our professional assistance by calling 570-424-7250.